The Sniper: Ghost Warrior series is a franchise that was created for a specific audience that wanted realistic sniping mechanics in a video game. But since then, the franchise has changed quite a bit. 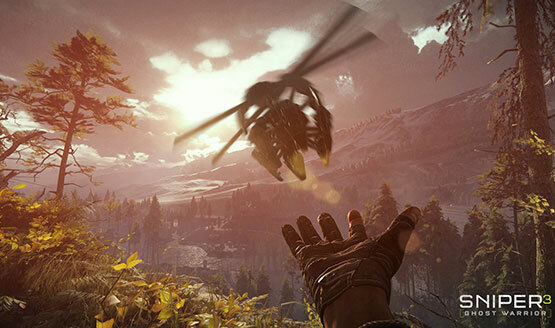 In its latest installment, Sniper: Ghost Warrior 3, the developers CI Games have decided to take a risk and switch from its tried and tested linear format to an open world format. As Ghost Warrior 3 has no narrative connection to the series’ previous titles, the game’s big shift from a linear format to an open world format was made slightly easier. In Ghost Warrior 3, players take on the role of Jonathan “Jon” North who is on assignment in Georgia while also working on a mission of his own. The game is divided into four acts played across three maps each with a varying number of main campaign missions with Ghost Warrior 3 featuring more main missions than its predecessors. While the story of the campaign is interesting, it feels more like a classic action or war movie, filled with its own set of clichés, predictable moments, and cheesy lines from its array of characters. Apart from the main campaign missions there are also side-ops that unlock at several points in the campaign which players can optionally do. The side-ops may affect the upcoming main campaign missions in some way but they aren’t necessary to complete the main campaign missions. Apart from the main missions and side-ops, the game’s open world is riddled with a large number of things to do. From rescuing civilians and clearing towns of terrorist to finding hidden items and searching for collectibles, there isn’t a shortage of things to do in any of the game’s three maps. Traveling the maps can be done through driving a somewhat always available car or players can fast travel to unlocked fast travel points in the map. Unlike its predecessors, where players are limited to using only one or two pre-determined weapons per missions, Ghost Warriors 3 give players access to a myriad of weapons throughout the game across three weapon categories – the primary weapons, which are the sniper rifles; the secondary weapons, which include assault rifles, machine guns, and shotguns; and the sidearms, which include pistols. Each of the game’s weapons have different characteristics including damage, recoil, noise generation, ammo capacity, fire rate, and more. The number of weapons and their variety give players the flexibility to choose a weapon loadout that fits their playstyle and the needs of the current mission. The game’s weapons can also be upgraded and customized, depending on the weapon with primary weapons having the most upgrade slots while sidearms have the least. The allowable weapons upgrades depend on the specific weapon, some can be equipped with silencers, bipods, and such, while others can’t. The weapon upgrades include a large array of sights and scopes, larger magazines for ammo, the addition of a silencer, a flashlight or laser sight, and more. Weapons and weapon upgrades can be unlocked either through finishing certain missions or, in the case of weapons, by picking one up from a corpse, which can then be purchased for use with in-game money. The player also has access to a myriad of gadgets such as silencer repair kits, a number of grenade types, throwing knives, remote-detonated C4 explosives, an array of mines and traps, and more. Players can equip up to a total of eight gadgets at a time. The large about of gadgets available allows players to equip themselves properly for the game’s missions. Ghost Warrior 3 also introduced a new drone tool, one of the biggest changes in the series. The drone, like other modern drones, can be controlled remotely and quite easily. Players can be used to spot and mark enemies, hack terminals, and more. It’s an almost indispensable tool that players will undoubtedly use before every mission. While it is possible to get through the game without ever or regularly using the drone, to give players a bigger challenge, it’s still a very helpful tool to help other players to get through missions in the most safe and efficient way as the drone allows players to know what they’re up against in missions and approach and tackle them accordingly. Like the game’s weapons, the drone is also upgradeable. Players can purchase modules that can improve and add to the drone’s performance and features, respectively. These modules include an increased battery module, which will allow the drone to fly for longer, a thermal imaging module that allows the player and drone to spot enemies easier, an improved camouflage module, and more. Another big addition that Ghost Warrior 3 has brought to the series with the shift from linear to open world format is safes houses. 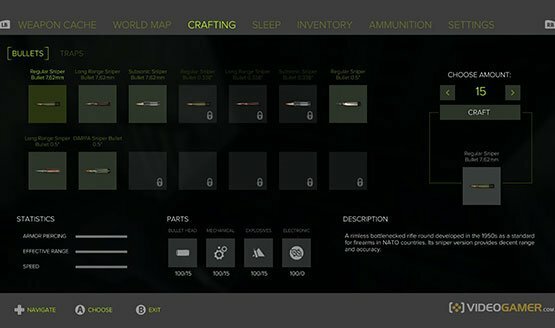 Safe houses, of which there are quite a few available in each map or region, are where players can rest to restore health points, conduct repairs on weapons and armor, check and accept missions, fix player loadouts, purchase more weapons and ammo, and access the workstation where players can craft ammo, gadgets, medical supplies, and more. Given the game’s title, the sniping mechanic or gameplay in Ghost Warrior 3 has been slightly improved. Instead of a simple and somewhat realistic sniping mechanic where the game shows distance as well as wind direction and strength then forces you to pinpoint where to point your crosshair to accommodate for those factors, the game now allows you to calibrate the distance setting of the sniper rifle’s scope to make it easier to properly place the scope’s crosshair, which further adds to the game’s realism and immersion. At the normal and easier difficulties, a dot still shows where the bullet is going to hit to help players hit their marks while the higher difficulties remove the dot completely, allowing for a more real natural and challenging experience. The rest of the game’s combat is equally as interesting as its sniping and doesn’t feel like a tacked on or secondary element. This is helped by the introduction of the game’s open world, which allows players to tackle missions in a large variety of ways including either going aggressive with assault rifles or machine guns or going stealth and sticking to using melee or close-range assassination attacks. Unlike the rest of the game, which has seen a number of improvements, Ghost Warrior 3’s graphics are definitely one of its weaknesses. The game’s visuals are quite lackluster (especially when it comes to its foliage) and its animations and effects are rather disappointing. The subpar visuals become even more apparent during the game’s signature bullet cam and the several cinematics that players trigger throughout the main campaign. Adding on to that, the biggest problems of Sniper: Ghost Warrior 3 aren’t found in its gameplay but in its technical performance. Some of the game’s loading screens, such as when players load a save or when transferring regions or maps, take at least five minutes (enough to quickly eat a meal) and respawning takes about half a minute. Fast travelling was the only loading time that was relatively quick but after such a long initial loading screen, it wouldn’t be unusual to expect that there would be no loading screens at all for both respawning and fast traveling. In a time where developers have tried and, at times, succeeded in eliminating loading screens from their games, it’s disappointing to see a game not only feature an incredibly long initial loading time but also be unsuccessful in eliminating the game’s other loading times after the fact. 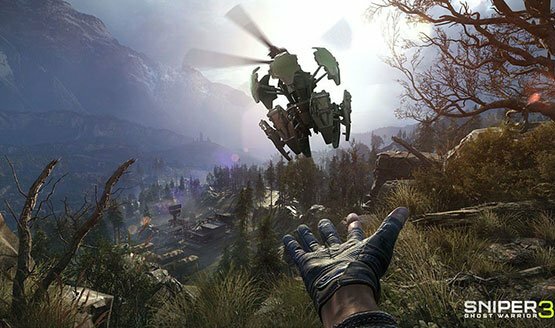 Sniper Ghost Warrior 3 also suffers from occasional framerate drops, which occurred during both combat and exploration, and the game crashed several times during the course of the review. Even a pre-release patch (that should be available on day one) did not do much to resolve the game’s performance issues, sadly. The Sniper: Ghost Warrior series has definitely come a long way since the original was released over half a decade ago. In spite the criticisms the series has received in the past, it’s been successful enough that CI Games was adequately confident to shift gears with Ghost Warrior 3 and take a huge risk. And while the developer was successful in improving some of the game’s elements including its core gameplay and open world, many of its other aspects, including its visuals and technical performance, failed to hit the mark. At its core, Ghost Warrior 3 is easily enjoyable but its issues just as easily breaks the experience. Review code for Sniper: Ghost Warrior 3 provided by publisher. Reviewed on PS4. For more information on scoring, please read our Review Policy here.